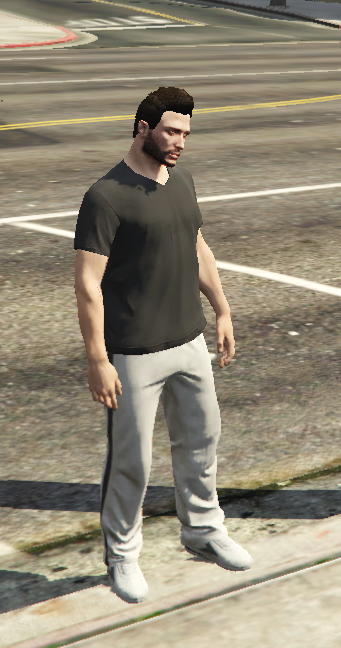 In this guide, I'll be walking you through how to create your own unique character in GTA World. The skin creation screen may appear complex in the start but in fact, it's very easy once you understand what the different options do, and how they affect your character's looks. Upon creating your very first character you'll be prompted to choose the skin of your character. In this guide I'll be covering the later option only with explanations for how the different options affect your character and how to RPly pick a skin that reflects your character's heritage, much like with the GTA Online editor. Before getting into details, let me explain how the skin editor works. It basically blends 2 different Models/Faces morphing them into one new face that has features of both the faces. Think of it as a father and a mother, and their child gets facial features from both of them as well as the skin tone/color. I pick one of the faces to reflect my character's father and the other to reflect my character's mother. I decide how much resemblance do my character have to both his parents and set the percentages accordingly. I then proceed to add details to my character's face, adjusting his facial features as I may. I'll use the "Head Blend 1" slot to represent the father's looks, but before that, we need to disable the mother's effect on the face, so whatever we pick in Head Blend 1 is whatever we see. For that we need to set "1 <- Blind Mix -> 2" to 0. Now we'll simply browse through all the possible faces in "Head Blend 1" until we find a face that resemble the father. 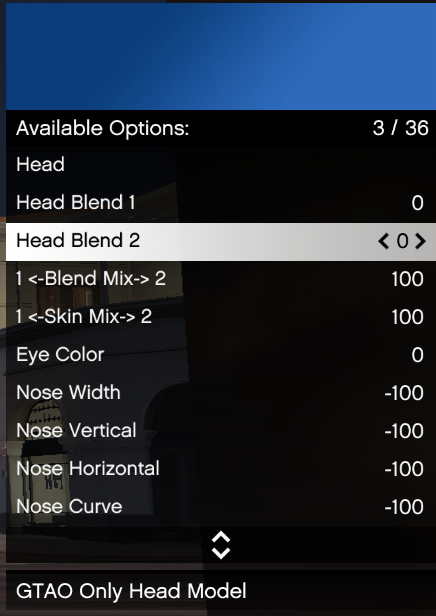 Now we browse "Head Blend 2" until we find a face that resembles the mother. Now that you've picked both your parent's faces, all you need to do is to set how much they resemble each of their parents by changing the values of "1 <- Blind Mix -> 2" where values close to 0 is more of the father and values close to 100 is more of the mother. For the skin tone it's the exact same process as the blind mix, but instead we change the value of "1 <- Skin Mix -> 2". By doing this you're done with creating basic face, in the next section we'll cover fine tuning that face further. The editor allows you to edit each and every single detail of your facial features, I'll be covering how each option affects your face in this section. the name is accurate, it reflects how wide the nose is. It defines how long the nose is, in the vertical direction (i.e. ends closer to mouth or a bit up). It defines how much the nose protrudes out. Defines how curved the nose line is. Defines the shape of your nose point. Defines how much the nose line is bent. Defines whether Eyebrows protrude or not. Cheek's protrusion from the face. Whether lips are full or thin. Whether jaw is high or low. Also name is accurate enough. 100 deep one | -100 doesn't have one. Other options such as blemishes, sun burn ...etc are easy to figure out and require no explanations. -You may change your skin after character creation by heading into one of the plastic surgeons indicated in the map. -For PEDS skins changing facial hair might be possible using plastic surgeon, experiment with the texture values of the face. -This guide will be updated with more formatting photos at a later time. -Feel free to comment with questions or notes! Is it just me rite, but i do some custom stuff and my arms vanish? It's because otherwise sometimes you would see your arms out of some clothes. The goal is to remove the arms models when you have let's say a vest, so that the two models does not overlap each others. It's forbidden of course to walk around without any arms and no vest to "hide" this. I'll cover the clothing and facial hair with details in the next part of this guide, but basically what Nervous said. We have multiple "Torso" and "Undershirt" options to go together with "Shirt". PEDS Catalogue link added to the bottom of the guide. Let me know if you run into issues, I'm always willing to help buddy!